The Ackerman Institute recognized six students who completed the Social Work and Diversity Program this year at a presentation in the Library held on May 7th. The six students are Dorimar Morales, Eddie Danner and Erika Sosa, from the Hunter College School of Social Work, and Adrianne Fiala, Jacqueline Juarez and Daniela Nunez from the NYU School of Social Work. Laurie Kaplan, Co-Director of the Program, noted that 2008 marked the 16th year of the Social Work and Diversity Program, which was initiated to bring more students of color into the field. The focus of the Program is on personal as well as professional development, and the group process incorporated into the Program often mirrors what students see when they work with families, she remarked. “This kind of program is very important in terms of what it brings to society,” Sippio Small, Co-Director of the Program, said. Mr. Small added that “the important thing in a democracy is to question” and that the Ackerman Institute had always encouraged its trainees to ask many questions. The Ackerman Institute initiated the Social Work and Diversity Program in 1992 as a result of the vision and generosity of Arthur Maslow, former Chair of the Ackerman Board of directors and current Trustee Emeritus. The Program was the country’s first initiative designed specifically to address the critical need for a significantly increased number of professionals of color in family therapy services in community-based social service agencies. 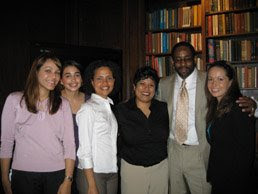 Currently, only four percent of family therapists across the nation are people of color although it is expected that the number of minority families in the U.S. will reach 48 percent of the population by 2050. the Program offers social work students of color the opportunity to intern at Ackerman and enroll in a postgraduate training program with scholarship support. Each student spoke briefly about his/her experience at Ackerman and presented a case. Eddie Danner’s life story demonstrated that at one time, he might have been a client at Ackerman. He was raised by a single mother, was later separated from her, and as a teenager, was drawn to street life in Harlem. Completing the Ackerman program represents a “personal triumph” he said, and he expressed his gratitude to his colleagues and the staff. “We support one another,” he said. Jacqueline Juarez commented on how a therapist can relate strongly to a family in treatment because often the family’s issues are similar to those in the therapist’s own life. She said she had a definite connection to the family she saw because fighting was a key issue, and as a child she had refereed family fights. Dorimar Morales said she thought the term “person of color” was a phrase coined by the dominant culture to lump all kinds of people together. Ms. Morales said she identifies in a variety of ways – as a woman, a Latina, a black and as a person from a Puerto Rican culture that is extremely diverse. In therapy sessions, she added, she identified most strongly as an immigrant although Puerto Ricans in the U.S. are not considered immigrants. As a result of her own anxiety about communicating with clients in English, Ms. Morales helped create a document called Diversity Conversation Guidelines that poses a series of questions for therapists to ask clients. The Guidelines help open communications and decrease anxiety. Erika Sosa told the audience that her work at Ackerman intersected with her own life as her experience in losing her father was amplified by her work with a family who also experienced a loss. She said she and her co-therapist had not always agreed about how to treat their family, but that their different points of view made them a stronger team and allowed them to grow as individuals. Adrienne Fiala observed that “beliefs influence behavior” and that she had learned how important it was not to let her beliefs influence the family she treated. She also noted that it was important to remember that different people take different meanings from the same action. The last student to present, Daniela Nunez, said that the parent/child relationship she saw in her client related to the relationship between her and her co-therapist. The experience helped her learn to open up eventually and has altered her way of thinking and feeling. Many audience members expressed great appreciation for the students’ honesty in discussing their lives and their work at Ackerman.